Hello, my name is Steve Cha. This is a brand new blog that I started to highlight my journey through the entertainment industry in the past, present, and future as an evangelist. I'm also using this medium to help promote a Christian autobiography that I hope to get published, with the help of enough support and interest in my work. I'll use this site to share some of my most memorable stories from the sets of Hollywood. During the past three years, I have shared the gospel with renowned actors, actresses, directors, musicians, extras, PAs, and a whole bunch of other people. 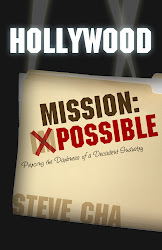 You'll know what Hollywood believes, and (if you're a die hard Christian like me) why the city needs your evangelistic support and prayers. So journey with me as I expound on stories, new insights, prayer requests, observations, and God's unbending truth applied toward a town that truly needs the light of Jesus Christ. I hope you'll find my thoughts to be soul-food for your soul. God bless! couldn't go to sleep. just visited this site for the first time.